Until yesterday, my children's snowpants hung unused on hooks in our laundry room since the beginning of November. Such a long period in winter without large amounts of snow is unusual in our area. I can't say I minded in the least (50 degrees in January is fine by me), but my children like to play in the snow and were a bit upset with the weather. In fact, my daughter remarked to me a while back that her snowpants were feeling sad. Now our world is covered in white and the cold temperatures are back. Yesterday's snowstorm brought enough snow to make travel difficult, but not enough to result in a school snow day. Even though the weather here was fairly moderate, several years ago, on January 12, 1888, schoolchildren in the Midwest plains endured one of the worst blizzards in our nation's history, "The Schoolchildren's Blizzard." The blizzard developed suddenly and without warning after a stint of warm weather. Despite many brave acts, hundreds perished that day including children walking home from their one-room schoolhouses. One of more widely known accounts of The Schoolchildren's Blizzard is that of a school teacher named Minnie Freeman who led her students to safety. (In fact, a historical marker in Nebraska mentions Miss Freeman.) Marty Rhodes Figley's early reader historical fiction book, The Schoolchildren's Blizzard shares Miss Freeman's heroics with young readers. Though fiction, the book provides readers with an idea of what it might have been like to have been one of Miss Freeman's students when that dangerous January 1888 Blizzard hit. Seven-year-old Annie and her older sister, Sarah, walk across the Nebraska prairie to their sod schoolhouse on a relatively warm January day in 1888. Once inside the school they learn from their kind and smart teacher, Miss Freeman. Their day goes smoothly until lunch time. The school children spot ominous clouds and quickly head back into the schoolhouse. The roaring blizzard winds wreak havoc on the sod schoolhouse, and Miss Freeman decides they must walk together through the blizzard to her house if they stand a chance of surviving the storm. Figley skillfully tells the gripping story of the terrible, historical blizzard in a way perfectly suited for young readers and, true to life, the story ends happily. Shelly O. Haas's muted watercolor pictures help in setting a gentle tone. Despite the subject, the story overall isn't too frightening or upsetting and it contains slightly subdued descriptions of possible events. The school door flies open, part of the sod schoolhouse roof blows off, and the children trudge blindly through knee-deep snow but positivity endures. In Figley's retelling, Miss Freeman remains calm, collected and encouraging -- a strong role model for her students and for the readers. "I am sure I only tried to do right. It was my plain path of duty in which I was led. I am thankful it has all ended so well. My sympathies go out to those who suffered so." It's hard for a 1st grader to visualize just how cold it got during the January 1888 Blizzard so I decided to have my daughter chart a temperature comparison. We used the Daily Weather History information available at Weather Underground to determine the high temperature on Jan. 11 and the low temperature on Jan. 12 in our area (55° and 15°F). 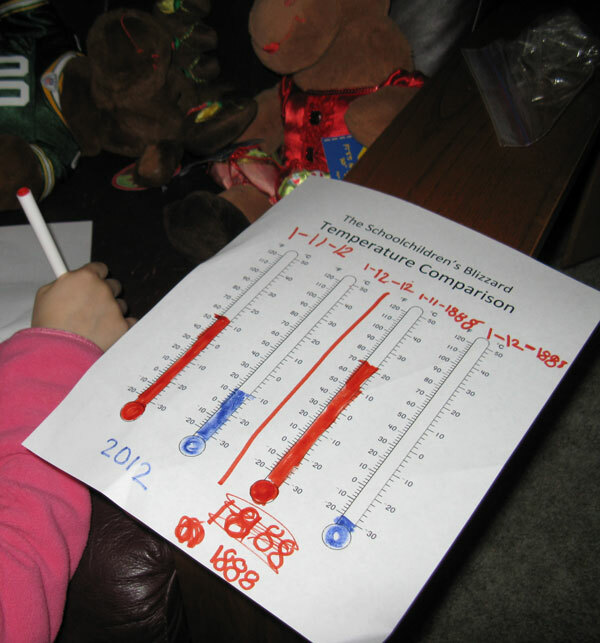 My daughter used a thermometer chart to compare these temperatures to the 1888 temperatures found on Marty Rhodes Figley's website (70° and -30°F). Many children today don't know a lot about life in a one-room schoolhouse. Through books like The Schoolchildren's Blizzard they can learn more about pioneer life, America's history and the struggles and happy times that children experienced in the past. It is important to me that my children take the time to learn and inquire about such things. As part of our studies we found a neat picture of sod schoolhouse at the Library of Congress website. Both my parents attended a one-room schoolhouse for a short time, as did my grandparents. This story prompted us to ask them more about their experiences. We learned that none of them had to remain overnight at school, caught in a storm. My grandmother also told us that the teacher boarded with her family. She and her siblings would ride with the teacher to school instead of walking. The teacher kept the horse in the school's horse shelter. I didn't realize some one-room schoolhouses had their own animal buildings, but it does make sense! I love the family information about the schoolhouse - so interesting! The temperature charting is great. We haven't had snow since October. My kids are hopeful, but there is none in the forecast. What an interesting story. It's worth checking it out when daughter is a little older. Here is an interesting fact for you - I've been living in US for almost 20 years now and still find it very hard to think in Fahrenheit degrees about temperatures and in gallons about volume. I don't know why, I just find it completely non-intuitive. You caught my attention because a couple years ago I read a thick book called The Childrens' Blizzard. I forget the author but I will never forget that story. All the more because it was true. After a cold winter, how easy and welcome it is to go out without your coat and enjoy that sunshine. And how quickly the weather can change. Thanks for the additional info and links! My father-in-law went to a one room schoolhouse through high school. I need to remember this book for Nebraska. This looks very good. 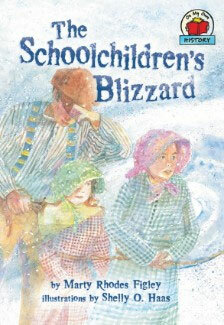 I always empathized with the Little House books when they talked about snow and blizzards. My grandparents always put up a rope between their door and the barn and garage on their farm in October, just in case. Love that this led into the chance to talk with relatives about their one-room schoolhouse experiences. That kind of insight is what brings history alive. Great book my dad (Greg Rhodes) and grandparents (cleave and Betty Rhodes) talked about the 1 room school house on route O growing up.i remember as a child going to granny's and reading a book I think was called Lydia about all things purple ,it was my favorite book at granny's house. Thanks for your time. Oh! I wish I could easily get this book over here. I recently read Wallace Stegner's brilliant short story about a blizzard - Genesis. If you haven't read it, I urge you to do so - but make yourself a hot water bottle to cuddle whilst you read it as the descriptions will definitely make you feel the cold! I had never heard of this blizzard but came across it when I was researching books on another 1888 blizzard in the northeast. So different than this year when we have yet to get a flake of snow! That sounds like a wonderful story. We haven't had a lot of snow this winter either. It's been a very strange season this year. If you're interested, here's my review of The Children's Blizzard by David Laskin, an adult nonfiction book. I would like to pick up the children's story for my urchins, and I like the way you extended the learning with yours.